Liverpool Heart and Chest Hospital is holding a free public health information event on Cardiac Devices. 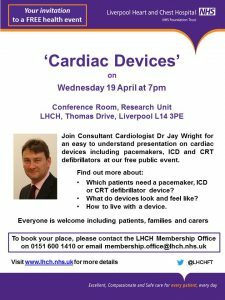 Consultant Cardiologist Dr Jay Wright will give an easy to understand presentation on a range of cardiac devices including pacemakers, ICD and CRT defibrillators. Which patients need a pacemaker, ICD or CRT defibrillator device? What do devices look and feel like? How to live with a device. There will also be an opportunity to ask questions at the end of the session. Everyone is welcome including patients, families, carers, students and colleagues. Our Election Information Open Evening is also taking place at 5.30 – 6.30pm before Cardiac Devices for anyone interested in becoming a Public Governor at LHCH for our Merseyside, Cheshire or North Wales constituencies.